This is such a great meal to make ahead and enjoy for quick dinners or lunches to go. You can certainly add in/swap out whatever herbs and veggies you want. No excuses for not eating well when you are prepared with something you love on hand! Zest and juice lemons over the cooked grains, add onion, garlic, nutritional yeast, and pepper and fold in. Add in the vegetables and stir together. Cover and chill for at least 2 hours. This will last several days in the refrigerator. Peaches are one of my favorite summer fruits. I have always loved adding them to my cottage cheese, but since I have switched to an anti-inflammatory and heart-healthy diet, I no longer eat dairy. 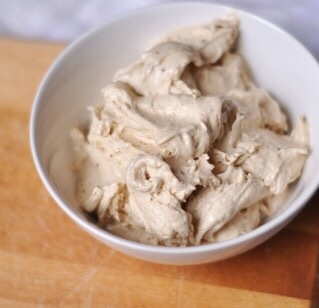 My solution: cashew cream! Super easy, slightly sweet and better than any dairy product available. Place cashews into a cup or bowl. Fill with water just until covered. Let soak about 2 hours (or longer). Place cashews and water into a blender. Add an additional 1/4 cup of water into the blender and blend on high. Add a little bit of water at a time to get the mixture turning and then to reach your desired consistency. The blending process should take about 3-4 minutes to get it creamy. Add cinnamon or vanilla extract if you would like. Place in a mason jar and store in the refrigerator or several days. For an anti-inflammatory drink, I was using turmeric powder. 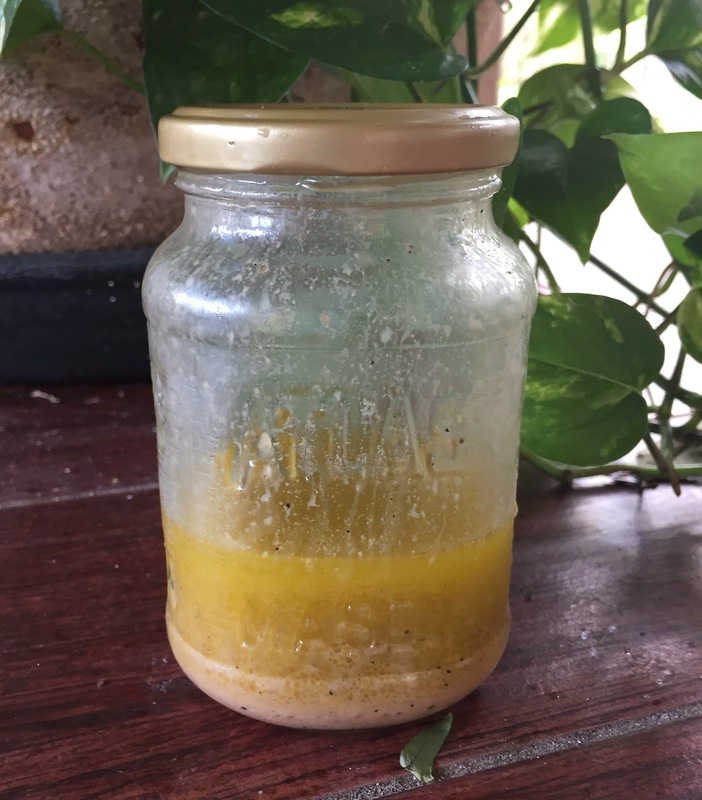 However, I was informed by a friend how much more beneficial the extract is, so I switched over to using the extract (you can order it from Amazon or make your own with a few tablespoons of grated turmeric and 8-10 oz of vodka and let stand about a month before using). The ginger is an anti-inflammatory like the turmeric and the lemon is great for an alkaline gut. The frankincense and black pepper are a must for complete absorption of the turmeric into the body. This is a slightly sweet drink and very refreshing. You can make a large batch and keep it in the refrigerator. This is one of my go-to snacks each day. I love chunky nut butter, so I’ve been creating my own version. I make a large batch of this, and then I put a dollop of it in a jelly mason jar. It is then ready for me to take (along with a spoon) for an easy snack on a busy day. You can use any variety of nuts and seeds and spices. Place the frozen bananas, milk and vanilla in a food processor. Blend several minutes until the bananas are completely whipped and creamy. We like to serve ours in mugs with melted peanut butter drizzled over the top and a sprinkling of mini chocolate chips. This makes about 4-5 servings. This is Joel from 4 years ago enjoying banana ice cream. It has been a long-standing “sweet” staple in our home, and it is still asked for. This vinaigrette is a light and refreshing dressing for any assortment of greens, over freshly roasted vegetables, or as part of a grain-based salad. It’s quick and easy, so there is no excuse for store-bought dressings that contain preservatives and unhealthy oils like canola, soybean, corn and the like. Add all ingredients into a glass jar. Screw on the lid and shake before each use. Store in the the refrigerator for 1 week. 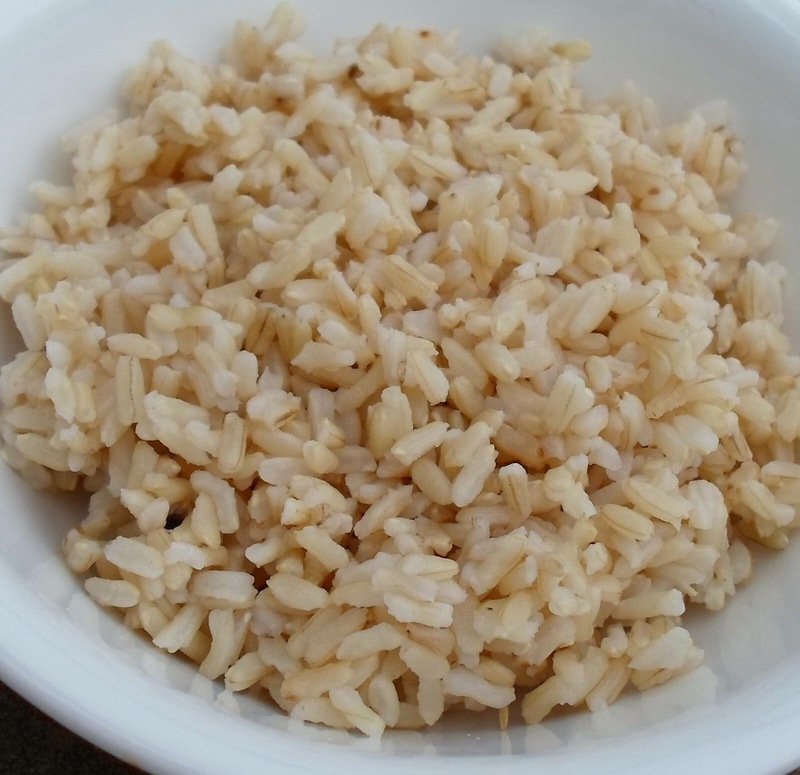 Slow Cooker Brown Rice – Serve or Freeze! I shared this super simple recipe on my Whole to the Core Facebook page, and I’ve had to search for it on there several times because I always want to make sure I have the ratio of rice to water correct (even though I should remember!). It is much more difficult to find that way, so I finally decided to make it a post. I will be heading home soon and starting this. It will go into our soup for tomorrow, and I will be freezing the rest for other meals like fried rice or to accompany chicken teriyaki. Oil the crockpot, place the rice in, pour in water, and cook on high for 2 hours. Season/flavor for use immediately or freeze in batches for future dishes. If freezing, pour into a large, glass baking pan to allow rice to cool quickly and then portion the rice and freeze in batches. This tower of tastiness was inspired by a dish I had in NYC. The restaurant where I ordered this served it cold, but I knew that it would be better with warm beets to melt the avocado, making it extra creamy. With that said, here is my twist on their idea. Preheat oven to 400. Lay beets on a baking sheet and spray with olive oil. Season with salt and pepper and sprinkle with chopped garlic. Roast for 20-25 minutes in the oven or until fork tender. As the beets become close to being done, slice the avocado. When beets are finished, begin layering the salad with a beet slice followed by 2-3 avocado slices on top of the beet. Repeat this layering until it’s 5-6 layers high. I sometimes garnish with crunched up kale chips when I have them made. Makes 3-4 servings. *Beets and avocados are high in Folate (great for women in their child-bearing years!) 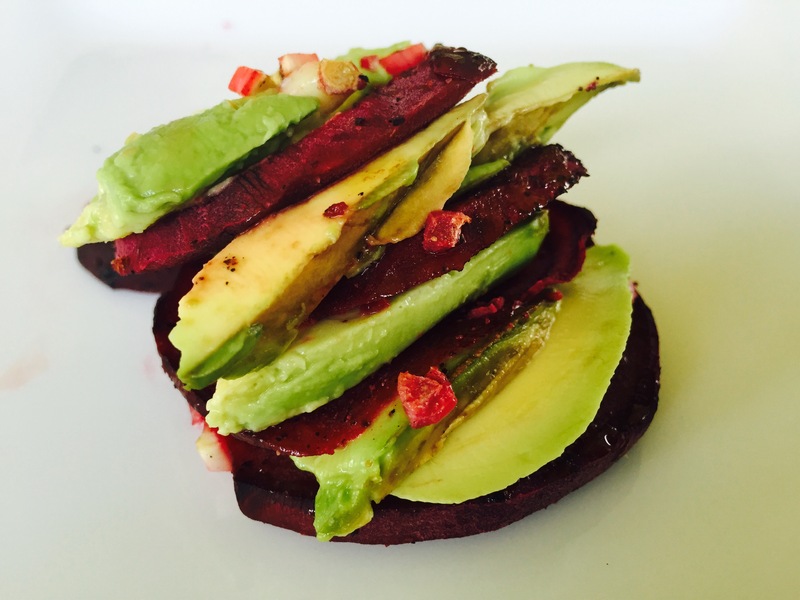 Beets are also a great liver cleanser and avocados are great for eye and bone health. When I took my oldest, Aleyah, to Season’s 52 a few weeks ago, I ordered this side dish simply because I saw it on someone else’s plate as we walked by to be seated. They gave be two large “steaks”, and I was kind enough to save one to share with my mom. I love to try to recreate favorite dishes from the restaurants I visit, so I grilled these up over the weekend, and 2 out of 3 of my kids love them. (The non-lover of the grilled broccoli will eat raw and steamed broccoli so I’m not complaining that she didn’t like this as much. Just leaves more for me!) I also grilled up some onion and tomato slices to accompany this. Slice broccoli lengthwise into 4-5 “steaks”. Spray with olive oil and lightly season with salt and pepper. Place on a medium high grill. Grill 7-8 minutes on the first side, flip, and grill an additional 7-8 minutes or until desired tenderness is reached. Place on a serving platter and brush with dressing. Serve warm. If you buy store bought honey mustard pretzels (or any flavored pretzels), you’ll find MSG, modified starches, hydrogenated oils, and other dirty ingredients. 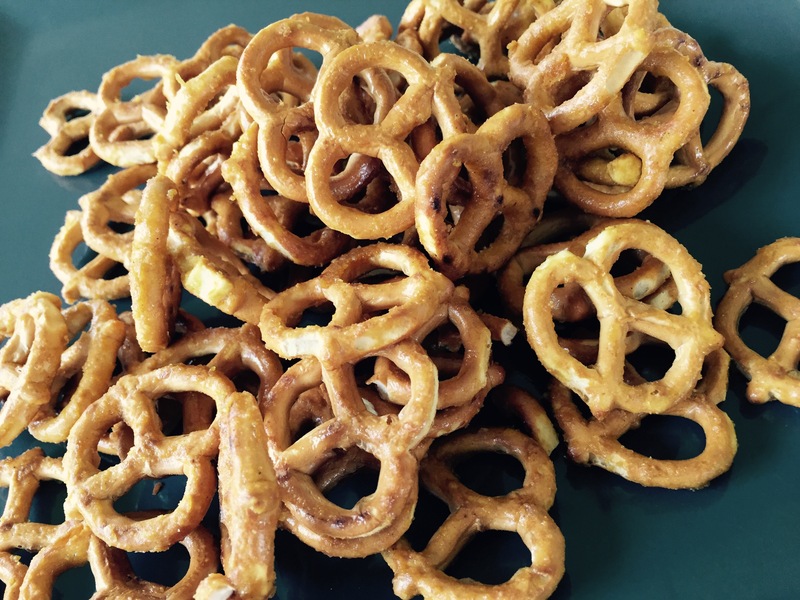 We made our own recipe with pretzels and 6 other real ingredients, and they won the approval of the whole household. In a large bowl, whisk all ingredients together except the pretzels. In a large baking pan, pour half the sauce into the pan. Place pretzels on top of the mixture and then pour the rest of the mixture on top of the pretzels. Mix well until all pretzels are coated and spread out pretzels in a single layer. Bake in a 325 degree oven for about 30 minutes, stirring every 10 minutes. Allow to cool completely before enjoying. Store in an airtight container.